Facebook is not only central to the world of modern technology in general, but also a significant part of the lives of its one billion (and counting) user base. One of the key elements of the world’s foremost social networking service is the famed News Feed, and Mark Zuckerberg’s team has just sent out invites to various members of the press inviting them to an upcoming special event, in which many significant changes to the News Feed will be showcased. 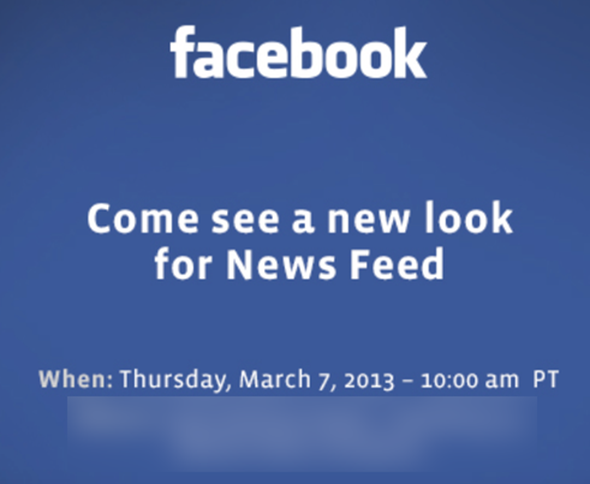 The event will take place on March 7th at Facebook’s Menlo Park headquarters, and although specific details remain under wraps for the time being, the very fact Mark Zuckerberg’s company has opted to host the event at its HQ suggests whatever is announced will be of great significance. Since last year’s dramatic IPO, Zuck and his team have been working tirelessly to indicate to shareholders that they are in the business of monetizing a company which, even now, is not fully utilizing all of the assets at its disposal. Facebook for iOS and Android has improved dramatically since the relative overhaul at version 5.0, but considering it still doesn’t generate an awful lot of money, the company has since become increasingly focused on driving more revenue from its expansive user base. When it comes to updating the service itself, Facebook has focused primarily on the Timeline, including recent alterations which placed stronger emphasis on messaging and interactions with friends. The profile pages have too been subject to recent modification, but the News Feed has, during this entire period, remained largely unchanged. As we know, the News Feed is one of the main sources of Facebook’s revenue, and if the social company is about to roll out, as I suspect, a bunch of changes demonstrating how they intend to further monetize this key area, it would go a long way to explaining why the announcement of said features is occurring at Facebook headquarters. We’ll will be covering all of the changes in one of our usual round-up posts when the announcement does take place next week, so make sure you stay tuned to our coverage here at Redmond Pie!